Stanhope & al. Nat. Bill. Fines of ancient Demesne Lands, Bill. Habeas Corpus Act, for Suspension of, Bill. Messages from H. C. with a Bill; and to return Sir Ja. Chamberlain's. Parliament to meet, in Case of His Majesty's Demise. Wines, Tobacco, &c for continuing Duties on, Bill. Comes Pembroke, Ds. Privati Sigilli. The Lord Chief Justice of the Common Pleas sat Speaker. 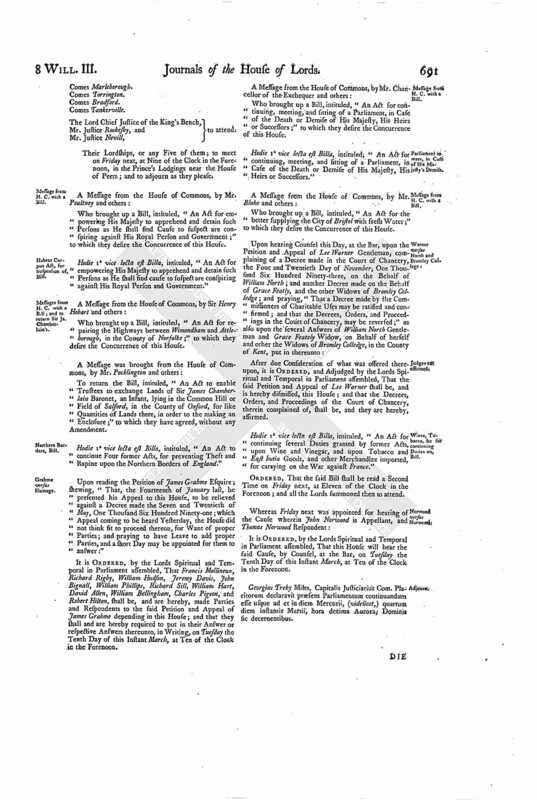 Hodie 1a vice lecta est Billa, intituled, "An Act for vesting the Manor of Holme, alias East Holme, and other Lands of Sir John Hanham Baronet, in the County of Dorset, in Trustees, to be sold, for discharging a Mortgage thereupon, and Payment of his other Debts." The Lord Ferrers reported from the Committee, the Bill, intituled, "An Act for vesting certain Lands of Thomas Bigg and his Wife, in Chislet, in the County of Kent, in Trustees, for Payment of Debts, and making Provision for their Children," as sit to pass, with some Amendments. Which, being read Twice, were agreed to. The Earl of Rochester reported from the Committee, the Bill, intituled, "An Act for naturalizing James Stanhope and others," as sit to pass, without any Amendment. Hodie 3a vice lecta est Billa, intituled, "An Act for naturalizing James Stanhope and others." Hodie 3a vice lecta est Billa, intituled, "An Act for settling the Personal Estates of Richard Jones Esquire and Mary Gyfford Spinster, Minors, in Trustees, for the Purposes therein mentioned." Hodie 2a vice lecta est Billa, intituled, "An Act for proclaiming and making effectual Fines levied of ancient Demesne Lands." Epus. St. Asaph. Ds. Willoughby Er. The Lord Chief Justice of the King's Bench, to attend. Their Lordships, or any Five of them; to meet on Friday next, at Nine of the Clock in the Forenoon, in the Prince's Lodgings near the House of Peers; and to adjourn as they please. Who brought up a Bill, intituled, "An Act for empowering His Majesty to apprehend and detain such Persons as He shall find Cause to suspect are conspiring against His Royal Person and Government;" to which they desire the Concurrence of this House. Hodie 1a vice lecta est Billa, intituled, "An Act for empowering His Majesty to apprehend and detain such Persons as He shall find cause to suspect are conspiring against His Royal Person and Government." Who brought up a Bill, intituled, "An Act for repairing the Highways between Wimondham and Attleborough, in the County of Norfolke;" to which they desire the Concurrence of this House. 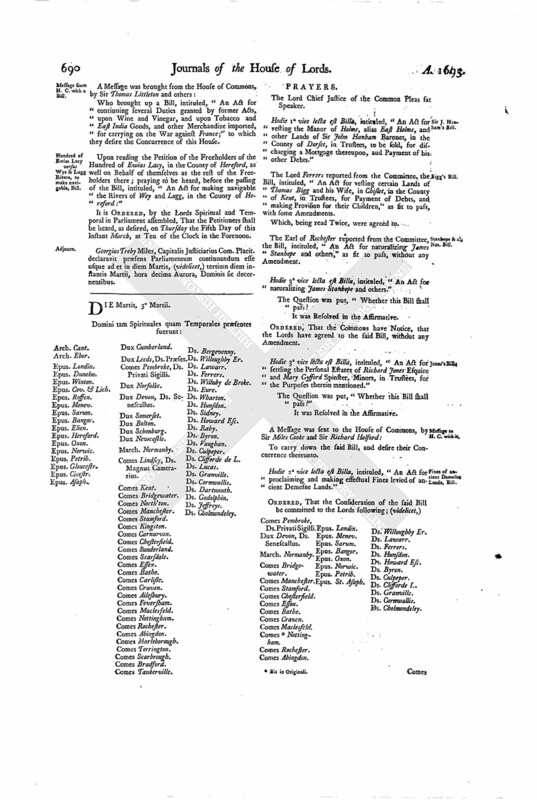 To return the Bill, intituled, "An Act to enable Trustees to exchange Lands of Sir James Chamberlain Baronet, an Infant, lying in the Common Hill or Field of Salford, in the County of Oxford, for like Quantities of Lands there, in order to the making an Enclosure;" to which they have agreed, without any Amendment. Hodie 1a vice lecta est Billa, intituled, "An Act to continue Four former Acts, for preventing Theft and Rapine upon the Northern Borders of England." 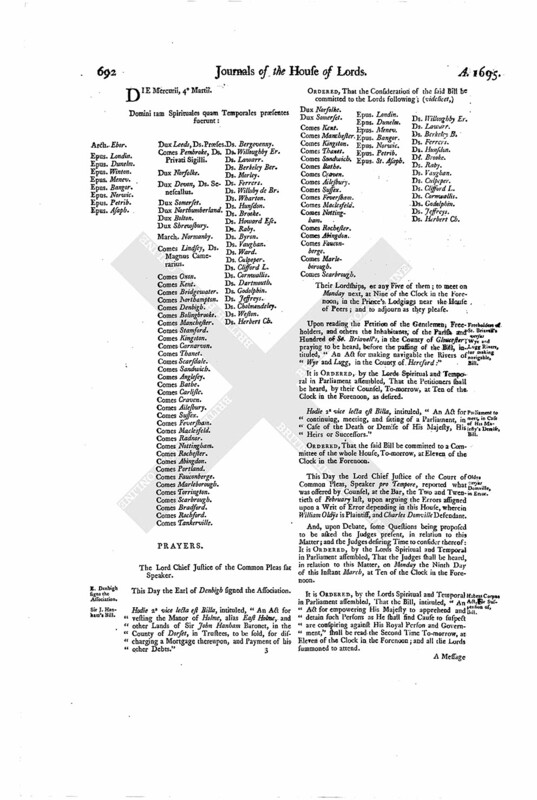 Upon reading the Petition of James Grahme Esquire; shewing, "That, the Fourteenth of January last, he presented his Appeal to this House, to be relieved against a Decree made the Seven and Twentieth of May, One Thousand Six Hundred Ninety-one; which Appeal coming to be heard Yesterday, the House did not think fit to proceed thereon, for Want of proper Parties; and praying to have Leave to add proper Parties, and a short Day may be appointed for them to answer:"
It is ORDERED, by the Lords Spiritual and Temporal in Parliament assembled, That Francis Mollineux, Richard Rigby, William Hudson, Jeremy Davis, John Bignall, William Phillips, Richard Sill, William Hart, David Allen, William Bellingham, Charles Pigeon, and Robert Hilton, shall be, and are hereby, made Parties and Respondents to the said Petition and Appeal of James Grahme depending in this House; and that they shall and are hereby required to put in their Answer or respective Answers thereunto, in Writing, on Tuesday the Tenth Day of this Instant March, at Ten of the Clock in the Forenoon. Who brought up a Bill, intituled, "An Act for continuing, meeting, and sitting of a Parliament, in Case of the Death or Demise of His Majesty, His Heirs or Successors;" to which they desire the Concurrence of this House. Hodie 1a vice lecta est Billa, intituled, "An Act for continuing, meeting, and sitting of a Parliament, in Case of the Death or Demise of His Majesty, His Heirs or Successors." Who brought up a Bill, intituled, "An Act for the better supplying the City of Bristol with fresh Water;" to which they desire the Concurrence of this House. After due Consideration of what was offered thereupon, it is ORDERED, and Adjudged by the Lords Spiritual and Temporal in Parliament assembled, That the said Petition and Appeal of Lee Warner shall be, and is hereby dismissed, this House; and that the Decrees, Orders, and Proceedings of the Court of Chancery, therein complained of, shall be, and they are hereby, affirmed. Hodie 1a vice lecta est Billa, intituled, "An Act for continuing several Duties granted by former Acts, upon Wine and Vinegar, and upon Tobacco and East India Goods, and other Merchandize imported, for carrying on the War against France." ORDERED, That the said Bill shall be read a Second Time on Friday next, at Eleven of the Clock in the Forenoon; and all the Lords summoned then to attend. It is ORDERED, by the Lords Spiritual and Temporal in Parliament assembled, That this House will hear the said Cause, by Counsel, at the Bar, on Tuesday the Tenth Day of this Instant March, at Ten of the Clock in the Forenoon. Georgius Treby Miles, Capitalis Justiciarius Com. Placitorum declaravit præsens Parliamentum continuandum esse usque ad et in diem Mercurii, (videlicet,) quartum diem instantis Martii, hora decima Aurora, Dominis sic decernentibus.